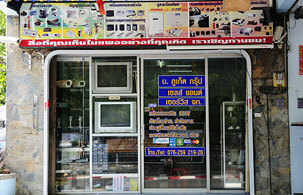 Phuket Group Sales and Service (better known as PG Sale and Service) is Phuket's leading supplyer of Security Cameras, Video Surveillance Systems, and CCTV Equipment for home use and business. The extensive knowledge and experience of the team together with an excellent after sale service make PG Sale and Service become one of the few names that people think of when they are looking for CCTV and security system. We supply a wide range of quality CCTV cameras and security products in a reasonable price. While our installation service are to be handled by team of professional who know well what they are doing. After over several years in business, we has served a number of clients in Phuket such as Robinson, Ocean Group, Phuket Patong Local Government, Phuket Vocational College, Honda Phuket Center and more. Telephone System: PABX, Automatic Telephone System, Answer System, Intercom, Telephone Wiring etc.